Carrie Turansky provides an enjoyable book in The Daughter of Highland Hall, her second novel in the Edwardian Brides series set in England’s time period of the same name. Turansky’s tale of Katherine Ramsey’s adventures, debacles, and successes as she attempts her debut in London’s 1912 season is a welcome transfer to a world so unlike today’s modern society. 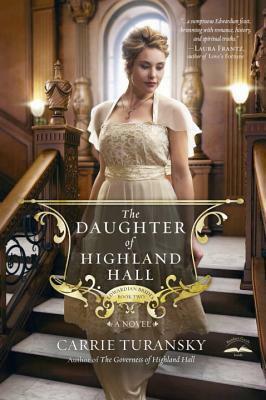 Often compared to England’s Downton Abbey, The Daughter of Highland Hall does rely upon the same themes and settings of the popular television show; however, the author takes advantage of various ideas that separate her novel from the drama of the Crawley family. While I adore Downton Abbey, I enjoyed The Daughter of Highland Hall precisely for those differences because I found the themes that profoundly impact my life shine through them in Turansky’s novel. Katherine Ramsey and Jonathon Foster, the protagonists of The Daughter of Highland Hall, are spending their time in London, attempting to discover and fulfill their callings in life. Turansky’s exposition of this discovery and action sets her novel apart as one of spiritual and personal maturation. Katherine, a debutante whose future depends upon this season’s success and her ability to find a suitable husband, aspires to rise within the ranks of London’s elite society in return for losing her place at her father’s estate. Although at peace with her distant cousin’s takeover of Highland Hall, which readers learn about in Turansky’s previous novel, Katherine finds herself pressured to reassert family dignity through a prosperous marriage. Katherine’s growth from a whiney teenager in The Governess of Highland Hall to a woman who knows her own mind in Turansky’s second novel makes her an admirable female protagonist. This maturation is not completely realistic—there is little supporting evidence, either through Scripture or dialog with other characters, that Katherine has given her life to God or understands the consequences of her decision to leave her debutant life behind. Nevertheless, Turansky’s storyline that demonstrates Katherine’s actions to become someone who lives out God’s directions for a fulfilling life are sincere and genuine. Jonathon Foster is a worthy hero that will no doubt have female readers eager to find a significant other of his caliber. Intelligent, kind, protective, loving, and faith-filled, Jonathon desires nothing more than a wife to love, a Savior to follow, and a passion to work towards. His storyline as a doctor for the poor in London is compelling; however, he is torn by his previous missionary work in India, and I imagine with her attention to historical facts and time-period detail that Jonathon could become an even more attractive character if Turansky returned him to his first home. Jonathon genuinely loves Katherine and works to win her affections throughout the novel. Nevertheless, while this romance is enjoyable it was not quite as compelling a story as Julia and Sir William’s in The Governess of Highland Hall. Opposites can and do attract in true life scenarios, but there are usually strong foundations those relationships….and Katherine and Jonathon just do not have that support in Turansky’s second novel. There is no compelling reason throughout this novel, aside from physical attraction, that Jonathon could fall for Katherine. Her beliefs are one of the few reasons that Jonathon has for his attraction to her, but she is just beginning to transform into a “baby” Christian at the conclusion of the novel. The newness of her faith and the limited understand that Katherine has of insinuates that she could not possibly have the foundation to love herself and God as He desires, let alone have that same love for Jonathon. At the conclusion of The Daughter of Highland Hall, though, their relationship did not work because although they experienced a few traumatic and worthy events, they did not know each other on a deep enough level. Perhaps in time if Turansky brings them into her third novel in the series their relationship will be plausible because they have had time to get to know one another’s faults, pleasures, desires, and goals. The Daughter of Highland Hall is a novel that I recommend for readers who love historical inspirational romance, especially ones who enjoy the Regency, Victorian, and Edwardian periods in an English setting. It ranks second in my list of favorites from Turansky, but I still delighted in the story and will re-read it for a lovely trip into one of my favorite time periods.